You can get up close and personal with the Bond swatches at The PolishAholic and Polish Addict: I’m partial to Live And Let Die and The World Is Not Enough, while The Spy Who Loved Me may make for a good Phantom Menace Amidala look. 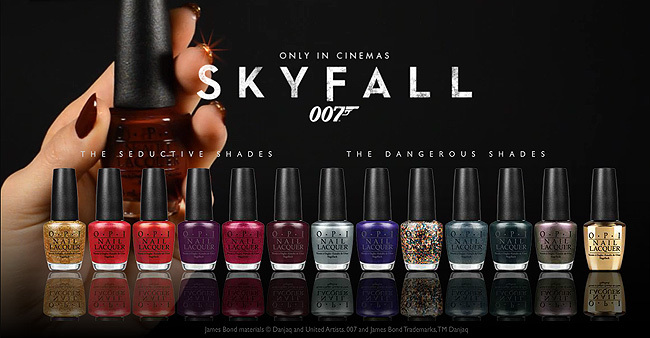 The Skyfall line is OPI’s holiday collection, and should be available at salons and (some) beauty retailers now. I’m a bit of a nail polish fan, too. Seriously EVERY FANDOM has a collection now. If Muppets can get it, why not us? This is a serious licensing opportunity you are missing out on, GEORGE. ^ Word. We definitely need one.